Maurice Flitcroft would turn in his grave. Remember the famous Englishman, who tried for so many years to qualify for the British Open – under a variety of names – before his horror scores saw him escorted from the golf course. It seems he may have a US version of him now doing the rounds. His name? Clifton McDonald. His score? 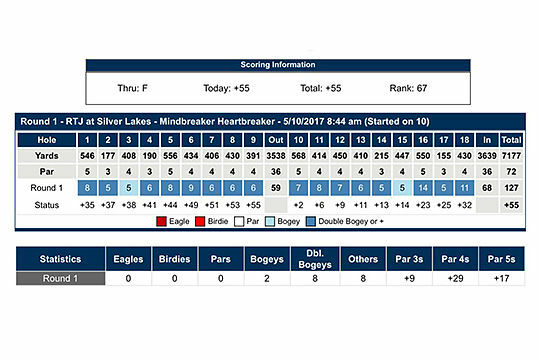 Well, how does 68 strokes for the front nine sound – before giving up? His goal? To qualify for the US Open, of course. Pity the poor guys playing behind him – or did he just have an unlucky – no make that horror – day at the links. One of those unlucky enough to be in the group behind McDonald was former All-American Lee McCoy, who advanced through local qualifying with a two-under-par 70. Yet it was his Twitter rant that provoked a lot more comment than his score. “The scorecard of the guy that played in front of me at US Open qualifying today. He shot 68 on his front 9 and decided to finish,” tweeted McCoy. So how did McDonald manage to sneak into the field for one of US golf’s biggest events? Seems there is a loophole which gave him the chance to shine. If you declare yourself a professional, you don’t need to submit a handicap, as it’s assumed you’re capable of the endeavour at hand. And the scoreboard appeared to indicate McDonald was exactly that – a pro. Just because you are deemed a golf professional doesn’t make you that good at the game. Or did he get stuck in a bunker or a hazard and run up a horror score and just have a day to forget in his golf career? Don’t laugh, there is a chance that really did happen. Either way, his chances of being on the first tee at Erin Hills in the US next month for the first round of the US Open do look decidedly slim. But the late Maurice Flitcroft would have been proud of him for trying. How hard is to Monday Qualify on the PGA Tour?